Declan Bonner is not ruling himself out as a possible candidate to succeed Jim McGuinness as Donegal boss but the county minor boss has yet to decide whether to apply for the post. Like many in Donegal, Bonner was taken by surprise by McGuinness's late night announcement on Friday night that he was stepping down from the job. "I thought Jim might have come back for another year," said Bonner. "At this stage, I haven't even considered it. I was away all weekend." 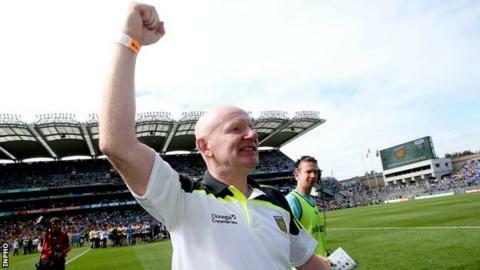 Speaking to BBC Radio Foyle, Bonner revealed that he had met with other members of the Donegal minor management team on Thursday night to discuss plans for next year. "We didn't really come to any decisions on that but then lo and behold, Jim resigns on Friday night. "At this stage, I have spoken to no-one [about the Donegal senior post]. I haven't decided anything at this stage. In fact, I haven't even thought about it." While some bookies reported receiving a large quantity of bets on former Mayo manager James Horan for the job on Monday, McGuinness's former assistant Rory Gallagher remains the favourite with most gambling outlets. Bonner acknowledges that the Fermanagh man, who is currently managing Donegal club Kilcar, looks a credible candidate for the position. "Rory worked with Jim for two or three years and they worked really, really well together." But for the most part, the early running for the job is largely a case of 'round up the usual suspects' with Martin McHugh, inevitably, high in the betting. McHugh has yet to comment on whether he will put his name forward although he did say in his Irish Daily Star column on Monday that McGuinness "will be an impossible act to follow". "It's a bit like David Moyes coming in after Alex Ferguson - you're nearly better coming in after the guy who replaces him." Damien Diver, who was one of McGuinness's assistants this season, is also being mentioned as a possible candidate though he is likely to be viewed as an outside bet. The Donegal GAA board are scheduled to begin the official search for a new manager on Monday evening and county chairman Sean Dunnion has said that he hopes a successor will be in place by the end of October.